On low cliffs above Crane Beach. Reached by a lift or steps, the wide, 250-yard-long stretch of pink-tinged sand, backed by a palm grove, is arguably the most photogenic beach anywhere on Barbados. It’s partially protected by an offshore reef, but the waves can still be big and swimming isn’t always safe (lifeguards are on duty). Sargassum (smelly seaweed) has recently been an issue at times, though the hotel has gone to great lengths to combat the problem. The hotel is out on its own in the often-breezy south-eastern corner of the island. There are exhilarating, wild beaches nearby (some good for watersports such as kite-surfing), but not much else of interest. To drive to the lively tourist areas of the south coast takes at least 20 minutes, and across to the calm beaches and upmarket restaurants on the west coast, around 40 minutes. It dates from 1887, and claims to be the oldest continuously-operating hotel in the Caribbean. However, most of what you see is modern. Spread over its 40 acres are 252 rooms (most in beige-coloured and turreted five-storey blocks), six restaurants, cafés and bars, an attractive faux village, its coral rock and wood-clad buildings in neo-colonial style, and much else besides.With winding pathways, lots of tropical vegetation and glorious views over Crane Beach and out to sea, it’s all very enticing, but you are cut off from the real Barbados. As well as a conventional hotel, The Crane operates as a timeshare resort. But don’t let that put you off: there is no hard sell whatsoever. On my stay, staff were keen to please, but overall the service was a bit inconsistent and somewhat disorganised – to do with the size of the operation, I suspect. 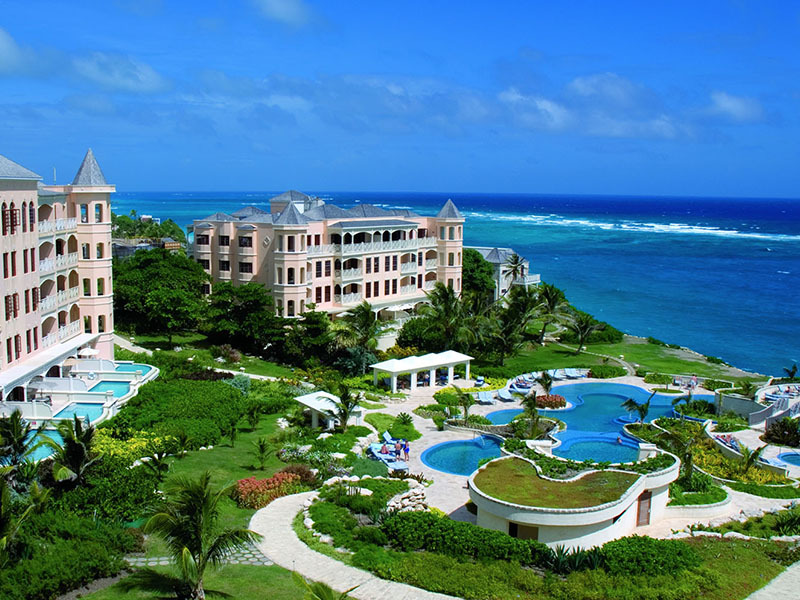 The facilities are among the best of any hotel on Barbados. A fabulous, giant, landscaped swimming pool complex has various pools set in tiers on a clifftop, and there’s a separate sophisticated, adults-only pool dramatically sited on the cliff above Crane Beach.In the village you’ll find shops that include a deli, art gallery and outlet of Barbados’ best-known department store. Other facilities include a small spa (just treatment rooms), gym and tennis courts. Rooms – labelled suites – are large or very large apartments. They have cedar shutters, mahogany furnishings and four-poster beds. All come with a terrace or balcony, and a vast marble bathroom with a whirlpool bath as well as a walk-in shower. Cheapest rooms – Garden View Junior Suites – have a kitchenette, while the rest have full kitchens equipped with a big fridge, dishwasher and washer/dryer.Many rooms have ocean views and bedrooms that are separate from the living area, and some also have private plunge pools. Dining options include: Zen, a highly-rated, high-end Japanese/Thai restaurant, overlooking Crane Beach through a wall of glass; L’Azure for international/Caribbean fare, and breakfast, in smart, pillared open-air surroundings, again spectacularly sited on the clifftop over the beach; and D’Onofrio’s Trattoria, an informal Italian in the village where I ate. My generously portioned salad and chicken pasta were good. Bear in mind that not all the restaurants are open every evening.On some days breakfasts are a full buffet; on others à la carte, when the Continental selection is a somewhat limited but the impressive cooked-to-order platters will see you through much of the day. There’s also an atmospheric, colonial-style cocktail bar in the village (good live music the night I was there), and a bar/grill in a lovely setting in the palm grove behind the beach.If you want to self-cater in any way, there are basic provisions in a shop in the village, and a large supermarket seven minutes’ drive away. Double rooms from $259 (£195) in low season; and from US $540 (£406) in high. Breakfast excluded: US $50 (£38) extra for two people. That’s great value in low season, but pretty steep in high season. Free Wi-Fi. There is level access to much of the property, and a lift to most rooms as well as the beach. Very. The apartment-style accommodation is ideal for families; there’s a jolly-looking, complimentary kids’ club (for ages 4-12) in the Crane village; the main swimming pool complex has a children’s area; and dining options include the family-friendly Italian restaurant.